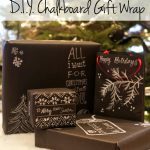 So the whole world has been obsessed with chalkboard over the past year, including myself. I’ve also gone totally noir this Christmas and decorated all things in black and white. So OBVIOUSLY, I had to incorporate a little chalkboard, with a little artsiness, with some crafty bits and share it with you lovely people.